A unique look at Harvard University’s early years, the impact of its first president, Henry Dunster and Harvard as a corporation – America’s oldest. What principles are behind its amazing success? What has made Harvard successful? This book examines the early principles behind Harvard’s success. 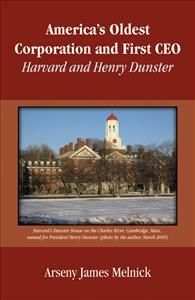 Its thesis is that a combination of sacrificial commitment and strong leadership by Harvard’s first President, Henry Dunster, was largely responsible for Harvard’s survival in its early years, while the corporate structure and the principles that he laid down beginning in 1650 played a key role in Harvard’s later enormous success as an institution of higher learning – a “brand” for intellectual excellence known and respected throughout the world. This book looks at that fascinating origin of two of American’s most important institutions: the university and the corporation.